The substructure is an inseparable component of the DEKMETAL façade system. It is attached to the support structure of the building and transfers the load of the visible elements and the effects of suction and wind pressure to the structures of the building. 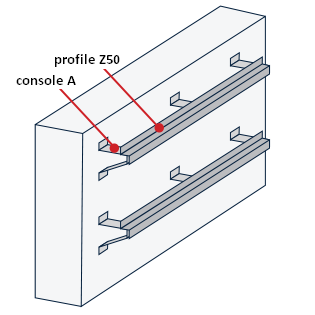 The actual frame is assembled from spot elements (consoles) and simple (usually galvanised) linear elements (J, Z and Omega profiles). Adjustment of the substructure between the individual components allows levelling the basic unevenness of the base, thermal insulation of the building with minimisation of thermal bridges and creation of a ventilated gap in the composition. This permanently ventilated gap contributes to the extraction of diffusing water vapour from the interior of the object, thus improving the internal climate in the building. The substructure can also be used as a substructure for other cladding materials, such as large-size Cetris, Cembrit, Fundermax, Alucobond, Reynobond or Alpolic boards and wood overlay panelling or linear latticed panelling with shift joints. 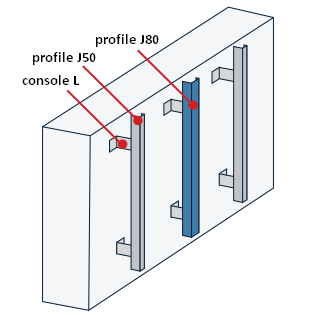 The Dekmetal substructure can also be used for glued stone cladding with the maximum load on the surface of the whole composition up to 100 kg/m2 – the design of the frame should be consulted with the Dekmetal technical department. All of the substructures are fully certified and the static parameters of all components are declared. 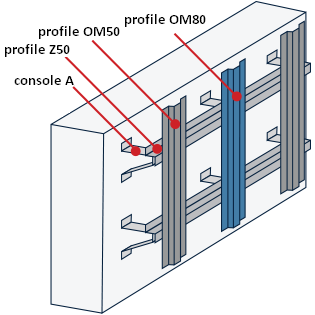 For example, to ensure accurate static parameters of the spot consoles, the consoles were numerically simulated by a computer programme and the corresponding substructures were physically tested to ensure agreement with this numerical model. This physical testing was executed in cooperation with the Faculty of Civil Engineering CVUT Prague and its certified laboratory in the Experimental Centre.